Recess by Narciso Desmadryl from Perkins Bacon Plates 1854 (Jan-Feb): 5 c. deep (rose) red-brown, imperforate Plate Proof horizontal strip of four on unwatermarked medium wove paper without gum, corner marginal from top left of sheet with italic imprint "Es preciso colocar las estampeas arriba de la.." at top, showing the misalignment of the stamps. First stamp with manuscript ink on '5' indicating the printer to alter the figure to '1' with further manuscript notation crossing through the 'S' of CENTAVOS as an Essay for the proposed 1 centavo value. Fourth Proof just cut into at base, a famous and rare Proof of great visual appeal. Cert. 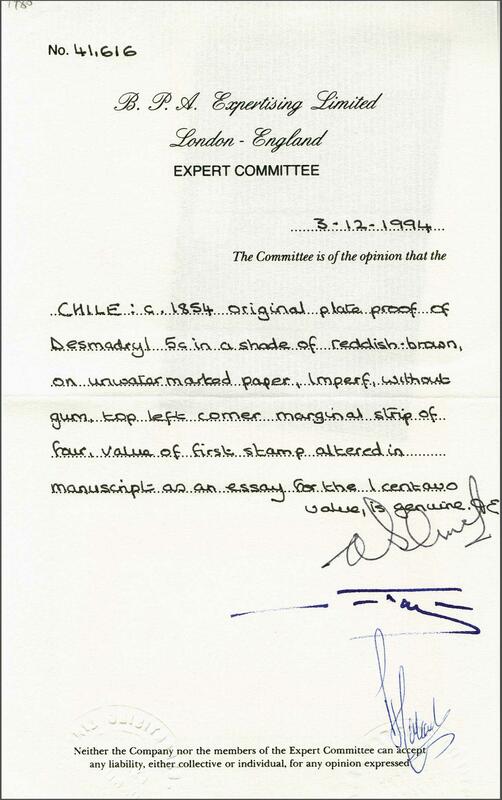 BPA (1994).rnProvenance: Collection R.A.G. Lea, RL, June 1994, lot 1980.